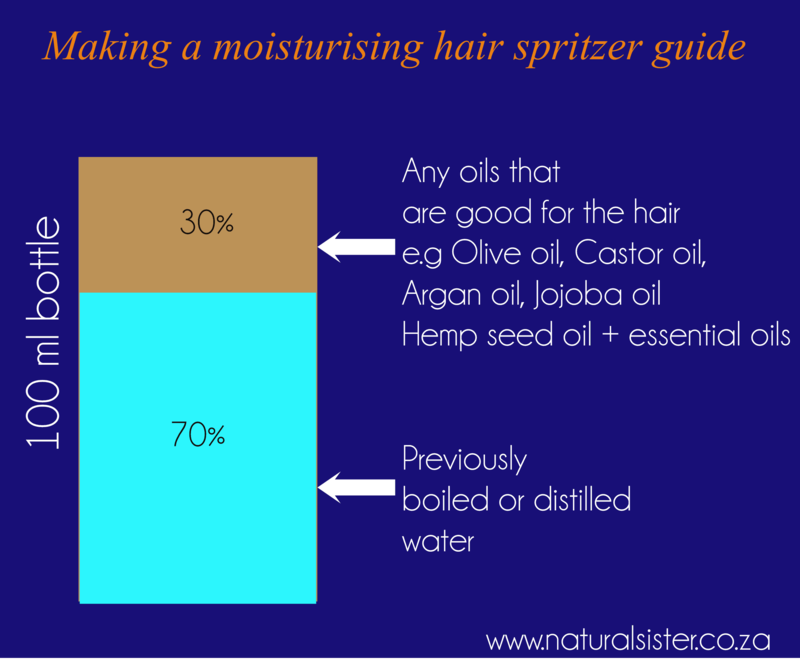 Making a moisturising hair spritzer is not rocket science and it is very easy to do on your own. 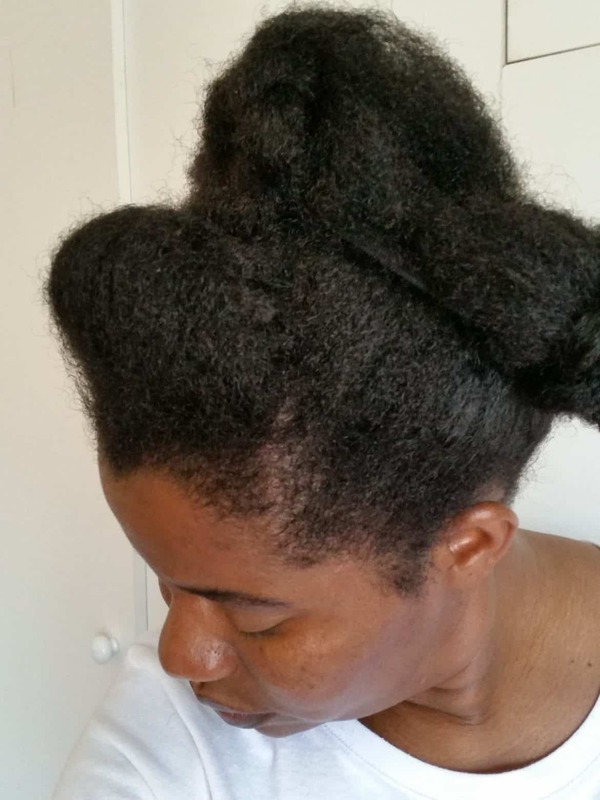 I know, I also did not have a clue when I started my natural hair journey and I tried this and that to make the perfect hair spritzer. Now I know that I basically need two groups of ingredients to make the perfect one any time and every time. We know water is the best moisturiser ever. So for that moisturising effect, you will need mostly water in your spritzer. You can choose a add on like liquid aloe vera juice to add to your water but the base line is, you will need water. Oils act as emollients and also nourish the hair and scalp with the nutrients they have. So oils are important to have in a spritzer to keep the water on the hair and scalp longer and also to add health and sheen to the hair. Water alone is not enough to make a spritzer unless you are going to seal the water with an oil or butter afterwards or the water will soon release to the atmosphere and your hair will feel too dry and straw like in no time. Oil alone is not good as well as this does not moisturise the hair and your hair may look glossy and shiny but still very dry. Our hair is thirsty and quenching it should be our priority in order to grow healthy hair. Tell me, what are your must have products in a spritzer? I’ve been very experimental with my spritz. But, the main thing for me is that it must be be budget friendly. I can hear you on that one. Same here. On a budget as long as the fundamentals are addressed. Great infor!! Have decided to give my natural hair more attention now. Have always been hiding it under weaves and braids since my “big chop”. Can I mix the oils in the spritz??? Most people keep it in the fridge for freshness. I normally make 50ml at a time and that lasts me about 2 weeks before going rancid. I suggest to keep it int the fridge though for freshness. After spitzing your braids, you can follow with a light oil to seal the moisture or just leave it like that. Don’t apply shea butter to hair in extensions as the butter may not melt well and may show badly in your extensions. However when hair is loose or the braids are with your own hair, you can apply a bit of shea butter after spritzing to seal the moisture. It is best to rub the shea butter in your palms and melt it before applying on the hair.